Do you find grocery shopping stressful? Are you constantly trying to find ways to save money when buying food, but don’t know where to start? Grocery shopping can be an intimidating experience for anyone – it can be expensive, time-consuming, and overwhelming. We often get even more intimidated when we consider making healthier food choices because these foods seem more expensive than processed foods. I’m here to tell you that eating healthy AND meeting your budget is easier than you think! 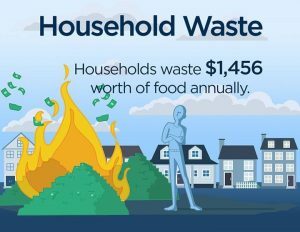 Did you know that Canadian homes waste around $28 of their groceries every week? This is almost $1500 of hard-earned money being thrown away each year! Unfortunately we hardly notice it – we throw out a piece of fruit because we forgot to eat it and it went bad, we trashed some leftovers we got tired of eating, or we threw out some vegetables that we frankly didn’t know what to do with or how to prepare. Writing out a grocery list, whether it’s pen-to-paper or on your phone, is the first step to saving money on groceries and throwing out less food. By writing down exactly what you need, you’re less likely to end up with things you don’t need or won’t use. Most grocery stores, like Superstore, Metro, and Walmart, have paper and electronic flyers available. Check these out when planning your groceries to make the most of these deals. For example, if your grocery store is having a sale on canned beans, it might be a good week to make some chili! Signing up for free loyalty programs can be a great way to save money too. An awesome option is the PC Points Optimum Program – a free loyalty program with Loblaws and Shoppers Drug Mart. You either download the free app and create an account, or ask for a free loyalty points card at Superstore, No Frills, or Shoppers Drug Mart. Each week, there are “points deals” – if you buy these items at any of the stores above, you earn points on your account. 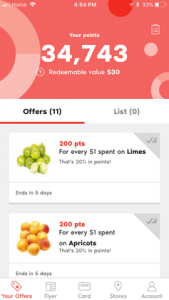 Once you save a certain amount of points, you can redeem them to get money off of your groceries! 4. Eat cheap, eat healthy! There are so many “hacks” to eating healthy on a budget that we often don’t even think of. For example, did you know that frozen fruits and vegetables are just as healthy as fresh? Plus, they tend to be more affordable, especially when fresh options are out of season. Canned fruits and vegetables are also great options! Look for vegetables with “no salt added” and fruits that are canned in water, not in juice or syrup. 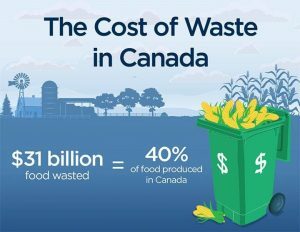 Not only are frozen and canned produce more affordable than fresh, you also don’t have to worry about it going bad as quickly, leading to less wasted food! Eating a more plant-based diet can save you money when grocery shopping. Health-promoting foods like beans, lentils, and whole grains (brown rice, wild rice, oatmeal…) are very affordable items that provide your body with important nutrients like fibre, protein, and iron. Making these foods the majority of your diet, along with fruits and vegetables, helps to keep your groceries nutritious but affordable. Eggs, canned fish, and yogurt are nutritious, affordable protein options to add to your diet as well. Using less meat will not only keep your costs down, but increase the nutrition of your overall diet. If you hunt or eat traditional foods, wild game like moose, deer, elk, and goose are all lean, healthy protein choices! Eating out, whether it’s at a sit-down restaurant or a fast-food joint, can take a big chunk of our food budget away. Even one $2 coffee daily can add up to $14 a week or over $700 a year! 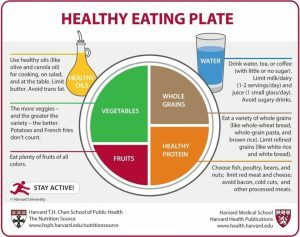 Restaurant meals cost more money compared to making the same meal at home, plus they are usually way higher in calories, fat, sugar, and salt. Learning to cook your favourite meals at home is a fun way to enjoy the foods you love while saving money AND eating healthier. There are endless amounts of free recipes online – get creative!